The Topo50 map series includes projection parameters to provide the map user with more information. Map reading references are grouped together. The north point diagram shows the direction of Grid North and Magnetic North at the centre of the map. Prototype Topo50 north point diagram showing Grid North, Magnetic North and the Grid/Magnetic angle. This is the direction of the vertical grid lines (eastings) on a topographic map. This is the direction from any point on the surface of the Earth towards the Earth’s North Magnetic Pole. 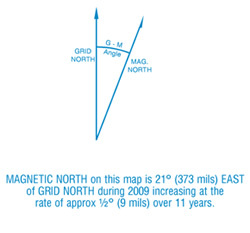 The angular difference between GN and MN is known as Grid/Magnetic angle. This varies across New Zealand. Because the position of the North Magnetic Pole moves slightly from year to year, the Grid/Magnetic angle will vary by a small amount each year. The map scale tells the map user about the comparative size of features and distances displayed on the map. The Topo50 maps are at a scale of 1:50,000. By using the scale bar provided, map users can determine the distance between two points on the map. Information on the datum and projection used for the Topo50 maps is also provided. Prototype Topo50 information panel showing the map scale, scale bar, and information on the datum and projection used. A grid reference is used to describe a unique position on the face of the map. Topo50 maps include a table describing how to give a simplified six figure grid reference. This simplified way of expressing the grid coordinate requires map users to specify the sheet number and a six figure grid reference. The sheet number is required as the six figure grid reference is not unique to a single sheet. Prototype Topo50 grid reference table.